Villard de Honnecourt (c. 1200-c. 1250) was a thirteenth-century French artist best remembered for his sketchbook, in which he drew objects, architectural motifs, animals, and people from real life (click here to view the sketchbook; the website is in French, but you can virtually flip through the pages of Honnecourt's sketchebook by clicking on the word "Feuilleter" and then the purple arrows above the drawings). The mere existence of Honnecourt's sketchbook shows how artists were taking a renewed interest in the world around them during the late Gothic period. Also during this time, artists started being known widely and valued as individuals, and they began signing their works. This era also coincided with invention of moveable type by the German printer-publisher Johann Gutenberg (born 14th century, died 1468), which eventually allowed for the rapid dissemination of knowledge on a scale never seen before. Giorgio Vasari (1511-1574), the Italian artist and writer, would later compare this period to the Renaissance and find it wanting in his highly influential "Lives of the Artists." The "Lives of the Artists" was a series of biographies focused on artists whose accomplishments led up to and were part of the Renaissance, beginning with Giotto, who would become known as the father of the Italian Renaissance, and ending with Michelangelo and Titian. An increased interest in naturalism - that is, in capturing the world as we see it - can be traced in art through the fourteenth and fifteenth centuries. Scholars were also increasingly engaged with Humanism. Thus this period, what is sometimes called the Proto-Renaissance, was a "rebirth" of classical ideals that led to the modern era. Gutenberg's moveable type allowed publishers to reprint not only the bible, but stories and treatises, especially from ancient Rome and Greece, that had once been forgotten or read only in high social circles. The study of Humanism was strengthened by the new circulation of ancient philosophies and stories, among other texts, and it inspired people to create a code of civil conduct, as well as new theories about education and scholarship. Humanism focused on the concept of the individual within society and the use of one's own senses in the search for knowledge. Artists also sought fame based on their merits outside the existing guild system. To this point, guilds were associations made up of certain types of merchants and craftsmen. For instance, there was a guild of wool merchants and a guild of armorers in Florence. Before the Renaissance, artists were often lumped in with house painters and carpenters, but during and after the Renaissance, artists created their own guilds and sought recognition as individuals. The enthusiasm for antiquity that began in Italy spread across Europe. Moreover, while Latin remained the official language of the Catholic Church, vernacular (non-religious) literature became more popular and it was printed more frequently. That led to the standardization of the Italian language, which had varied by region until that time. Medieval style and conventions still dominated the way art was made and looked, but there was more of an attempt to break away from such conventions during the 13th and 14th centuries. City-states came to power during these years as empires broke up in the Romanesque and Gothic eras. In Italy, each city-state was governed by executive bodies, councils, and special commissions. Each kingdom had their own sources for revenue and support, and they all enjoyed the start of an age of economic prosperity. Politics were often tied directly to religious bodies and the Catholic Church, which in turn encouraged many religious commissions. A break in the Catholic Church, called the Great Schism, occurred in 1305. The Great Schism was sparked when a French pope was appointed and he settled Avignon instead of the traditional Rome. This caused a divide between those who thought the papacy should stay seated in the Vatican, in Rome, and those who objected to the discord they perceived in that Italian center. This tension led both parties to comission propagandistic works in an attempt to sway parishioners. Also in the 14th century, the Black Death (Bubonic Plague) eliminated 25 to 50 percent of Europe's population in only around five years. People were witness to diseases and outbreak never witnessed in the history of human civilization. These events led many to seek refuge in Church doctrine. Sculpture: There was an interest in classical sculpture throughout the Middle Ages. Nicola Pisano (1220-1284) was among the first known sculptors to show interest in classical forms and conventions in the late Middle Ages. The marble reliefs and ornament he created for the pulpit for the Bapitstry in Pisa blended medieval traditions with those inspired by antiquity. (The pulpit was the place from which the priest would hold the church service; above left.) 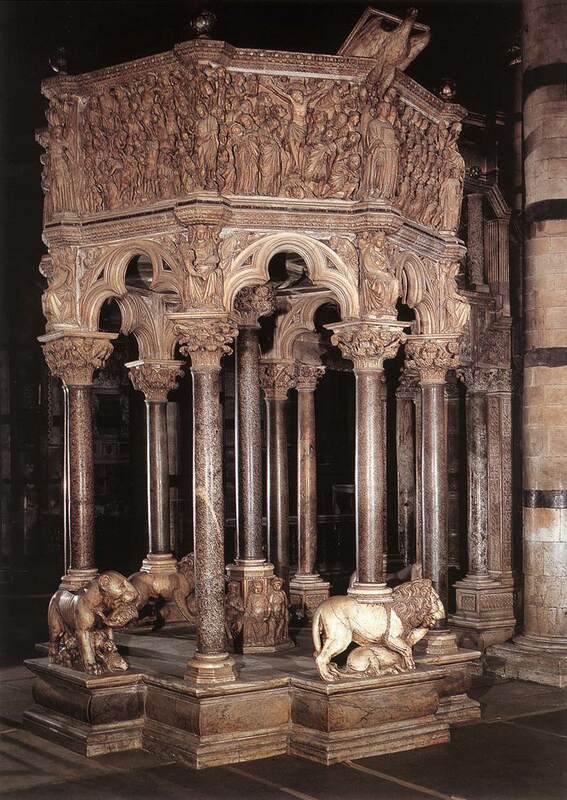 The tri-lobed arches and lions were features associated with the Middle Ages, but the round arches and the capitals were based on classical motifs.The bushy capitals Pisano used were variations on the classical Cornithian capital, and the rectangular relief panels he used to clad the pulpit recalled ancient Roman sarcophagi. The panel at the above right, which combines scenes of the Annunciation and the Nativity, is reminiscent of Etruscan and Roman sarcophagi in which figures would lay in a half-reclining pose, like the central figure of Mary here. The figures seem substantial, which also closely resembles classical relief sculpture. Scholars have even been able to find models on sarcophagi that Pisano would have known. This altarpiece was created mostly in the Byzantine style: the figure stands in a frontal pose and his body seems relatively flat. The gold background was often used during the Middle Ages to denote the realm of Heaven, so its use here both emphasizes the spiritual nature of the scene and it connects this painting to earlier works. The scenes along the sides contrast with the flat, frontal main figure of Saint Francis; the figures there look more naturalistic and dimensional as they seem to occupy real space. During this time, religious orders and confraternities became even more important, and they helped spread holy ideas based on the teachings of different saints and those saints' modes of piety. For instance, Saint Francis believed he could come closer to God by rejecting worldly goods. To do so, he stripped himself in a public square and committed himself to a strict life of fasting, prayer, and meditation. It was said that he received the stigmata for his actions. Stigmata were wounds that replicated those received by Christ on the cross, and we see two of Saint Francis's stigmata in his hands. The robes he wears here became the fashion of the Franciscan Order. Cimabue (c. 1240-c. 1302) also seemed to respond to the impulse towards naturalism that we saw in Pisano's work. His Madonna Enthroned with Angels and Prophets (above) still looks back to the Byzantine style, with its emphasis on flat, almost geometric planes and symmetry, and the gold used for the background and embellisments. However, Cimabue constructed a deeper space for the Madonna and surrounding figures to occupy than artists in previous periods. Although it still remains part of Byzantine tradition, it hints at some changes future generations of artists would explore. NOW IN THE YEAR 1276, in the country of Florence, about fourteen miles from the city, in the village of Vespignano, there was born to a simple peasant named Bondone a son, to whom he gave the name of Giotto, and whom he brought up according to his station. And when he had reached the age of ten years, showing in all his ways though still childish an extraordinary vivacity and quickness of mind, which made him beloved not only by his father but by all who knew him, Bondone gave him the care of some sheep. And he leading them for pasture, now to one spot and now to another, was constantly driven by his natural inclination to draw on the stones or the ground some object in nature, or something that came into his mind. One day Cimabue, going on business from Florence to Vespignano, found Giotto, while his sheep were feeding, drawing a sheep from nature upon a smooth and solid rock with a pointed stone, having never learnt from anyone but nature. Cimabue, marvelling at him, stopped and asked him if he would go and be with him. And the boy answered that if his father were content he would gladly go. Then Cimabue asked Bondone for him, and he gave him up to him, and was content that he should take him to Florence. Giotto filled his painting of the Madonna Enthroned with sturdy figures and architecture. The angles of the throne and the steps in particular show that he was trying to work out a way to capture perspective, or the recession of objects in space. He is not totally successful - the edges of the steps splay outwards instead of following the same orthogonal angle, for instance - but this marks an important shift towards an understanding of how to render objects in real space. The Virgin Mary is still idealized here but her body seems to be substantial under her robes. We even get the sense that Giotto used models for the figures in this altarpiece, since each seems like an individual. Click here for a Smarthistory documentary Part 1, Part 2, Part 3, and Part 4. Giotto frescoed these murals in the Arena Chapel, which was a private chapel belonging to a wealthy merchant located near an ancient Roman amphitheatre in Padua, Italy. The main focus of the building was on the interior. Thirty-eight panels, each with a painted illusionistic frame, illustrates the complete life of Christ. Along the bottom register, Giotto painted panels of faux marble veneer along with allegories of the virtues and vices in grisaille (that is, entirely in gray, black, and white). The vaulted ceiling was painted a vivid lapis blue and dotted with gold stars to represent the realm of heaven. The same blue used in the backgrounds of the scenes of Christ's life. Individual panels are all framed with decorative borders to separate them into registers or levels. Please refer to the above linked videos for the specific descriptions of some of Giotto's innovations. Thus, according to Vasari, Giotto was able to learn from Cimabue and then surpass his master. Vasari called the Byzantine style the manner of the Greeks, and credited Giotto with rejecting this style and creating a new one that led to the Renaissance. He believed that Giotto brought back to life the true art of painting by drawing inspiration from everyday life and using living people as models - a practice that had not been done in the preceding centuries. Vasari placed Giotto on a pedestal and saw that artist as the bridge from the Gothic and Byzantine (Greek) style to the Renaissance. He emphasized the artist's use of a naturalistic style derived from observation. Vasari presumed that Cimabue was Giotto's teacher but that he had been influenced by many styles and other artists, which resulted in a major shift in expression. Giotto restored naturalism and relied on sight for gaining knowledge of the world. Other artists developed singular styles as well, and they engaged with naturalism in different ways. The church and governing body of the Republic of Siena, a city near Florence and Padua, also commissioned many artworks. The people of Siene were especially devoted to the Virgin Mary, even more so than their neighbors. The creation of this altarpiece was a major achievement. It measures 7 feet high and 13 feet across, so was massive in scale. The back of the altarpiece was painted with more than two dozen scenes in individual panels. Those panels were removed and split apart, to be sold to museums around the world. The altarpiece blends Byzantine traditions with some innovations that look forward to the Renaissance. The rigidity of the figures, the use of a gold background, and the flat haloes belong to the Byzantine style. However, Duccio also individualized the faces and poses of the figures, and softened the outlines and folds of the drapery. Because this was a major altarpiece for an important church, the artist was limited with how much he could depart from the norm. He did experiment in some areas, though, as with his panel showing the Betrayal of Jesus (below), in which the figures are substantial and lively, even though they are still set in the more conventional stage-like setting. Martini was a pupil of Duccio. He developed what came to be known as an International Style. Artists working in this style often depicted splendid processions using brilliant color, lavish costumes, and ornate ornamentation. This contrasted with Giotto’s heavier, more naturalistic style. Martini's paintings are occupied by weightless figures rendered with flowing lines, set within ambiguous, flat settings. He also incorporated symbols into his work. In the Annunciation from 1333, we see the following symbols: the lilly represents the purity of the Virgin and the book symbolizes knowledge. The Virgin holds her hand to her throat in a gesture of modesty. Her blue robe was painted blue, which was the most expensive pigment because artists ground precious stones, lapis lazuli, to make this color. The dove represents God. 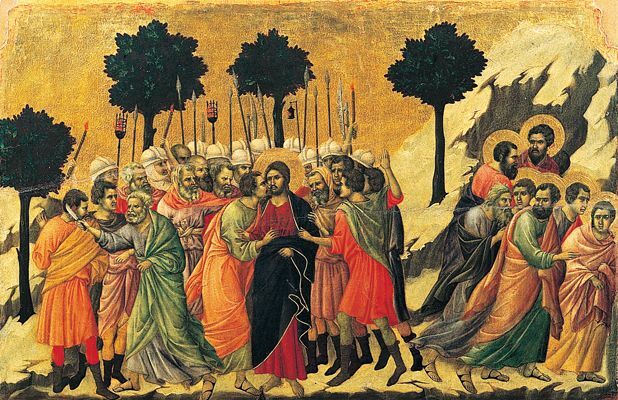 Lorenzetti was also a pupil of Duccio. He focused especially on capturing convincing spatial illusions. The Birth of the Virgin was painted for the Cathedral of Siena as part of a series honoring the Virgin Mary. The painting seems almost like a diorama illustrating the narrative. Architectural features, like the spaces between the scenes, overlap with figures, which creates a sense of space. This was a significant move towards integrating figures into more believable architectural spaces. Ambrogio was the brother of Pietro and also a student of Duccio. The paintings from the series illustrating the Effects of Good Government and the Effects of Bad Government were part of a series of frescos created for the town hall of Siena, Italy. By showing the effects of good and bad government in the city and countryside, the frescoes aced as a sort of reminder to those who governed the city-state within the town hall. The mural project gave the artist the chance to study everyday life and use it as metaphor. It also gave the artist the chance to practice new ideas of perspective in depicting the cityscape and landscape. Florence was another dominant and hugely influential city-state during the 14th century. They were fiercely proud of their wealth, which they had earned largely through teh textile industry. The Florin, the currency of this city-state, was also set as a monetary standard throughout much of Italy, which was another point of pride. The Cathedral in Florence was intended to be the “most beautiful and honorable church in Tuscany.” The exterior was decorated in the Tuscan fashion with marble-encrusted geometric designs to match the existing Baptistry of San Giovanni. The Baptistry can be seen in the picture to the left above; it is the smaller white, octagonal structure in front of the large Cathedral (near the lower left corner of the aerial photograph). The Baptistry was already in place and there was a smaller church on the site of the Cathedral, which had been removed to make way for a much larger, grander structure. Though built in the Gothic period, the Cathedral does not have many obviously Gothic features. Whereas Gothic structures like Church of Notre Dame in Paris seemed to soar dizzyingly upwards, the Cathedral in Florence was built with thick columns and heavy bases, which gives it a sense of weight and permanence. The builders also did not include Gothic tracery or flying buttresses. The nave is spacious and the strong horizontal planes guide the viewer's eye to the altar, the heart of the church, at the end of the hall. The building was large so it could accomodate as many people as possible, so the aisles were more open and connected to the nave than was usual. Whereas other Gothic edifices seemed to connect visitors with the heavens, the Cathedral in Florence was a building of this world. On the other hand, the geometric patterns connected the structure to buildings associated with the classical past. The dome, designed by Filippo Brunelleschi and built in 1420 to 1436 is a monument of the Renaissance. The bell tower next to the Cathedral (seen to the lower right of the church entrance on the aerial photograph above) was designed by Giotto, who is otherwise known as a painter. This bell tower is separate from the church, as was typical in Italian structures. While towers built in the Gothic style tended to shoot upward as one continuous element, this tower is subdivided into cubic sections so we notice the parts as they relate to the whole. This taps into another Renaissance idea, in which the relationship of the parts of an object worked beautifully on their own and as part of the whole. This emphasized intellect over emotion, and connects to the idea of rational thinking associated with this period.